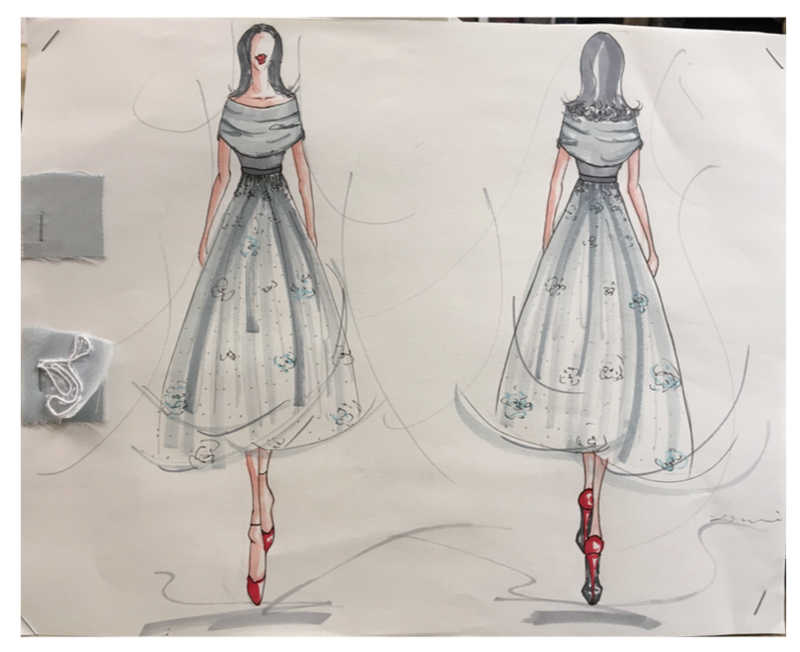 Tasked with creating custom gowns for SPU's 125th anniversary gala, these student designers began with just a Pinterest board and some sketches. 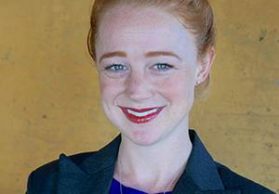 As the vice president for university advancement, Louise Furrow had the task of organizing Seattle Pacific University’s 125th anniversary gala event. 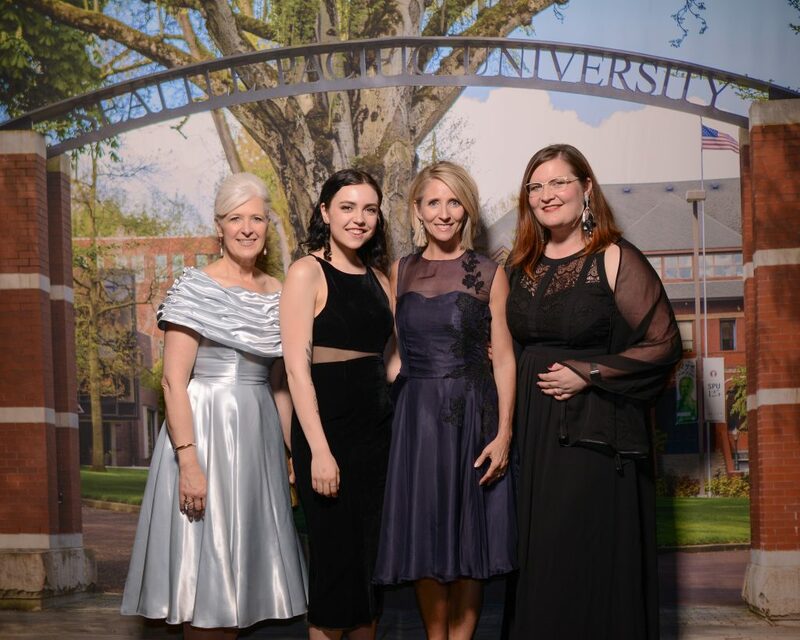 With a goal of showcasing student talent in as many aspects of the gala event as possible, Furrow wanted to include student fashion designers by having them design the dress she would wear to the gala. Pam Martin, wife to University President Dan Martin, loved this idea and wanted to wear a student-designed dress as well. This idea sparked a yearlong, ambitious project that resulted in two unique creations worn by Furrow and Martin at SPU’s anniversary gala. “She really wanted to represent as many departments as possible during the gala, to really showcase all of the different talents and skills that our students have,” says Sarah Mosher, faculty for Family and Consumer Sciences and Theatre departments as well as SPU Costume Design supervisor. Furrow and Martin first announced the design opportunity to students at SPU MODE Fashion Group’s annual fashion show in the spring of 2016. They provided interested students with Pinterest boards for visual inspiration and described dress requirements. Over the summer of 2016, students put together their sketches and planning boards to be presented to Furrow, Martin, and faculty in SPU’s Department of Family and Consumer Sciences in the fall, a Project Runway-inspired process. By mid-October, Furrow and Martin selected their respective student designers: junior Syl Xu and sophomore Sarah Maberry, both apparel design and merchandising majors. After finalists were chosen, Furrow and Martin met with their student designers to talk about their vision, discuss design adjustments, and schedule times for fittings and consultations throughout the year. Mosher, Associate Professor of Clothing and Textiles Raedene Copeland, and Professor and Director of Apparel Design and Merchandising Jaeil Lee were involved in the initial selection process and planning process with Furrow. Mosher then worked with the students step by step. She attended dress fittings with the student designers and coached them in the techniques they’d need to complete the gowns. While the students did receive financial compensation for their work, they say the learning experience they gained was invaluable. 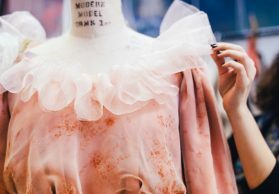 Xu, an experienced designer, went into the process confident in her abilities, agreed that making the garment took much more time than expected — especially given the fact that she was accepted to the Fashion Institute of Technology Fashion Design Program in NYC in the middle of designing Furrow’s dress. A transfer student who grew up in Nanjing, China, Xu began to study apparel design at SPU in the spring of 2015 and is nearly done with her degree. 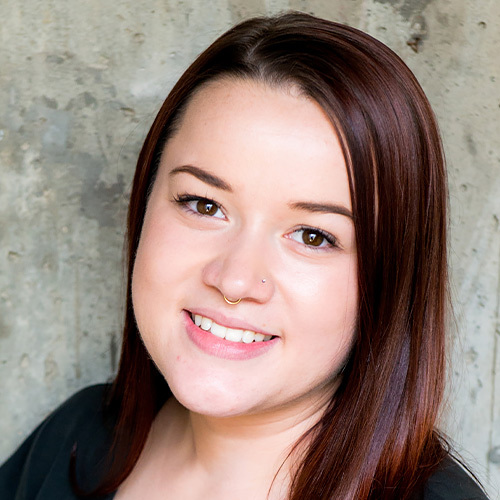 She first completed the yearlong program at FIT before returning to SPU for one last quarter. Based on a combination of Furrow’s interests, Xu chose to use silk for the dress as she thought it was the best fit: “elegant, simple but beautiful,” Xu says. She started working on the garment in November, but after starting at FIT in January, she flew from New York to Seattle for her Spring Break to finish it. Overall, she says it took her about 300 hours to complete the garment — and that the project was great preparation for her time at FIT. “This dress really helped me a lot, both with construction and regarding the understanding of the garment and how to manage my time,” Xu said. Neither Xu or Maberry had participated in such an intricate process before, but Maberry saw it as an opportunity to push herself and try something new. While working on Martin’s dress, she was also creating clothing for the annual SPU MODE Fashion Show. She discovered a big contrast between working on the heavy denims and thick fabrics she used for that collection and the delicate and slippery fabric she used for Martin’s dress. Maberry appreciated the opportunity to work with a client, and make something for an event. She said that having the help of a professor made the experience less intimidating. Both Maberry and Xu had the opportunity to attend the gala, however Xu couldn’t attend because she was preparing for exams in New York. Maberry and Mosher both attended and got to see the finished results of the students’ handiwork. Throughout the evening, Furrow enjoyed the opportunity to share with other guests how her dress was designed by a student.